The Nevada Department of Taxation recently released their updated Medical Marijuana Excise Tax Collections numbers with figures representing collections through May 2016. The numbers are compelling in their growth. 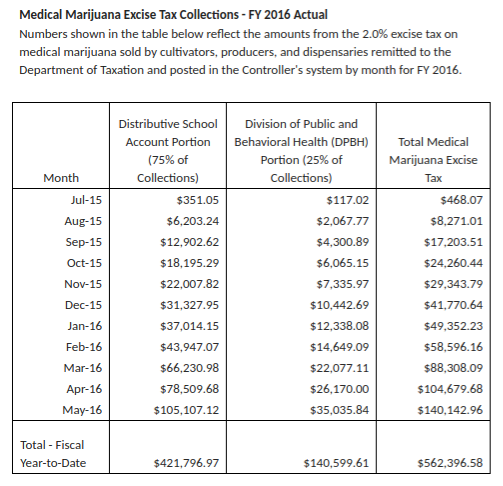 From April 2016 to May 2016, the Distributive School Account Portion, which represents 75% of excise tax collections for medical marijuana in Nevada, grew by $26,597.44, from $78,509.68 to $105,107.12. The Division of Public and Behavioral Health Portion (representing 25% of excise tax collections), grew a healthy $8,865.84 from April 2016 to May 2016. This number represents double the growth from March 2016 to April 2016, which presented growth of $4,092.89. Total Medical Marijuana Excise Tax growth from April 2016 to May 2016 was $35,463.28 and measured $140, 142.96. In the fiscal year to date through May 2016, medical marijuana’s excise tax has brought $562,396.58 into Nevada.